License free fishing: The Ontario Gov’t designates two periods throughout the year as license-free. 2017: February 18-20 (12:01am SAT to 11:59pm MON) and July 1-9 (12:01am SAT to 11:59pm SUN).Participants fishing without a license must fish under the Conservation fishing license limits which are set out in the current Ontario Recreational Fishing Regulations Summary. 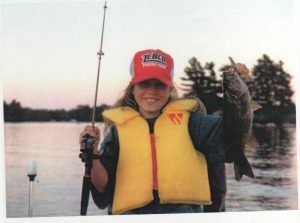 With the exception of the licensing requirement, Ontario fishing regulations, fees and limits continue to apply during license-free days. Printed copies of the summary are available at licence issuers and ServiceOntario Centres. Not long ago an angler’s expertise was measured in pounds of fillets and photographs with stringers of dead fish. Now, live releasing all or part of the catch is more common, as anglers across Ontario become more conservation-oriented. They realize that no body of water has a limitless supply of fish, and understand that they have a responsibility to protect and improve the fishery. Spring 2015 finds your Lake Stewardship Committee continuing to plan and execute fisheries enhancement projects around the lake. Over the last year we have placed some artificial habitat along selected shorelines. Often referred to as a “Fishsticks” program, it involves the placement of submerged trees along inactive or remote shorelines to provide enhanced aquatic habitat for a variety of fish species as well as other invertebrates, amphibians and reptiles. Over the last 2 years, several trees that had fallen or were cut down by their owners were floated to secluded locations around the lake and anchored to rocks or trees on the shore. These trees slowly submerge to form great subsurface habitat. We are still on the lookout for more trees to transport and fasten with cables or rope to uninhabited sections of shoreline around the lake. If you have any trees that have fallen on your property recently or you are planning to cut down a tree but don’t need the wood please get in touch and we’ll drag it away for you and put it to good use! In 2015, Watersheds Canada was the recipient of $74,000 in funding support from the Department of Fisheries and Oceans Recreational Fisheries Conservation Partnerships Program and $3,500 from TD Friends of the Environment Foundation, for the completion of the White Lake and Christie Lake Fish Enhancement Project. The goal of the project was to make improvements for Ontario’s recreational fisheries and water quality, by naturalizing shorelines and providing and enhancing fish habitat. Projects like this help to address loss of native fisheries and declining quality of warm water sport fisheries, such as walleye and restoring areas brought about by waterfront development. With partner support from the Lanark County Stewardship Council and other groups and volunteers, we successfully completed three walleye spawning bed enhancements, improved thirty-eight fish habitat locations with brush bundles on White Lake (located in the four townships of Lanark Highlands, McNab/Braeside, Mississippi Mills, Greater Madawaska) and Christie Lake (located in Tay Valley Township). As well as naturalized fifteen properties, with 1062 native plants. 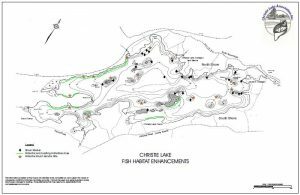 Fish habitat enhancement with the use of brush bundles and weighted Christmas trees, was also conducted at 19 locations on Christie Lake located in Tay Valley Township in Lanark County. With support from the Christie Lake Association various locations were determined and mapped. Equipment was purchased and organized with volunteers. This project took place on several weekends over a three-month period due to volunteer availability. Many lakes are now lacking natural woody structure due to cottages, marinas and resorts that all want to clean up their waterfront properties by removing natural fallen trees, branches and stumps. The brush bundles will provide habitat for the fish for shelter, reproduction and feeding. Algae and microorganisms will attach to the bundles, providing food for fish and waterfowl. The fish can also use the structures to lay their eggs, and the young fish then can hide in them to escape larger adult predatory fish, such as pike and walleye. In addition, turtles and snakes can utilize the brush bundles for cover. The final phase of the project is to conduct native species planting on nine properties on White Lake and three properties on Christie Lake, with shoreline vegetation to provide shading and a runoff buffer to promote spawning and rearing habitats and increase productivity for warm water fish species such as walleye, smallmouth and largemouth bass, northern pike, yellow perch, crappie and panfish. Fifteen shoreline properties have been stabilized where runoff, erosion, vegetation removal and nutrient loading have affected fish habitat. Hunting is enjoyed by many local hunters. Christie Lake falls within the Ministry of Natural Resources (MNR) Wildlife Management Unit (WMU) 67 (Map) – pdf 1.3MB . For information on hunting seasons (including hunting methods) for specific wildlife within WMU-67, please refer to ‘How to Determine When Hunting Seasons Occur in Your Area’ on the MNR website. You can also download the MNR 2015-2016 Ontario Hunting Regulations Summary . The Province of Ontario has proposed the expansion of the spring bear hunt pilot project. For more information, visit http://ofah.org/2015/10/massive-expansion-of-spring-bear-hunt/. If you become aware of a fish or wildlife related infraction, please report it. Call the MNR TIPS Reporting Line at 1-877-TIPS-MNR (847-7667). If you prefer to make an anonymous report, you may call Crime Stoppers at 1-800-222-TIPS (8477).